Be the first to share your favorite memory, photo or story of Darlene. This memorial page is dedicated for family, friends and future generations to celebrate the life of their loved one. 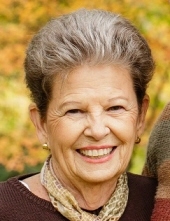 Darlene Impecoven, age 81, of Ames, passed away on March 28, 2019 at Mary Greeley Medical Center in Ames. A memorial service will be held at 2:00 P.M. on Wednesday, April 3, 2019 at the First United Methodist Church in Ames. Friends may call at the Adams Funeral Home from 5-7:00 P.M. on Tuesday, April 2, 2019. Burial will be at 12:00 P.M. on Thursday, April 4, 2019 in the Galva Township East Cemetery. Darlene was born on November 2, 1937 in Sioux City, Iowa to James and Rose (Higgins) Wilson. She was the younger sister of Ronald James Wilson. Darlene graduated from Sioux City East High School in 1955. After a two and a half year courtship, she married Robert Wayne Impecoven on June 25, 1956. They were partners for life, parenting three children: Linda (Valgene) Lind of Ames, Scott (Jane) Impecoven of Eugene, OR, and Diane (Timothy) O’Neil of Quad Cities. The couple proudly had nine grandchildren and eleven great-grandchildren. Darlene took great pride and joy in her family. She was a spit-fire matriarch, and was so loving to each. Robert and Darlene happily resided in Ames, where Darlene was a homemaker while her children were growing up. She eventually took a position at Ames High School, where she acted as attendance secretary and the iron fist of the restricted study hall, when the children were older. Due to Darlene’s health issues, she and Bob moved to Mesa, AZ in 1984, where she became one of the leading Allstate Insurance Agents in the state. Her unique combination of tenacity and caring not only made her a successful agent, but also made her integral in her role as lay reader of the First United Methodist Church of Mesa. Darlene and Bob retired in 2000 and returned to Iowa in 2007 to be closer to their family. They lived in Boone for eleven years, but ultimately returned to Ames. Funeral arrangements are under the direction of the Adams Funeral Home and online condolences may be left for Darlene’s family at www.adamssoderstrum.com. Memorials may be directed to the family and will be passed on to various charities dear to Darlene’s heart. To send flowers or a remembrance gift to the family of Darlene Impecoven, please visit our Tribute Store. "Email Address" would like to share the life celebration of Darlene Impecoven. Click on the "link" to go to share a favorite memory or leave a condolence message for the family.